Only approximately 12% of drug candidates in clinical trials will reach the market due to unpredicted liabilities in pharmacokinetics, pharmacodynamics, efficacy, and toxicity (1). Novel techniques, including organs-on-chips, are critical to accelerate drug development and better predict drug disposition and toxicity. Currently, a major focus of research is the creation of physiologic models of the proximal tubule, the primary site in the nephron for drug clearance and a primary target cell for drug-induced nephrotoxicity. Standard preclinical models for kidney function and toxicity can be grouped into several groups: animal models, ex vivo systems, and cell-based models. In vivo animal models allow for studies in an intact physiologic environment. However, because of species differences in blood flow, plasma protein binding, and transporter expression, information on tubular secretion acquired from animal studies cannot always be extrapolated to humans. In addition to mammalian models, zebrafish embryonic models are emerging as toxicity models due to simplified anatomy and response to nephrotoxins that recapitulates mammalian AKI. Ex vivo isolated perfused kidneys, kidney tissue slices, and isolated kidney tubules possess a complete kidney transporter system, and among in vitro models, they are most representative of the in vivo environment. A handicap of these models is limited viability: up to only a few hours after isolation/preparation. Primary cell culture consists of human proximal tubule epithelial cells (hPTECs) grown in two-dimensional (2D) monolayer cultures; thus far, cells grown in culture maintain physiologic activity for only 2 weeks. Use of single donors in any cell culture system can result in significant interindividual variability, which can lead to erroneous generalization. Multiply transfected overexpressing transporter cell systems are a relatively new model; although not expressing all transporters as seen in vivo, polarized mammalian cells overexpressing human transporter proteins localized to appropriate membranes are useful to elucidate vectorial transport pathways across a tubular epithelium. However, the final expression level and activity of the transfected protein(s) are not well controlled, leading to challenges with in vitro to in vivo scaling. Given the lack of reliability of current models, there is a critical need for robust, predictable in vitro models of the proximal tubule that can assess both kidney tubular secretion and the potential for tubular injury (2); 3D cultures that better recapitulate the biostructural scaffolding and microenvironment (often referred to as microphysiologic systems [MPSs]) represent the latest advance in bioengineering (Figure 1A). Along with studies of kidney tubular secretion (and reabsorption) in a new drug development setting, MPSs of the human proximal tubule may also prove useful for prediction of drug-drug interactions at the human kidney proximal tubule and the effects of endogenous inhibitors (uremic solutes) that are known to accumulate in CKD. Microphysiologic systems are able to recapitulate many characteristics and functions of a kidney proximal tubule. (A) Characteristics and physiologic functions of an optimal kidney proximal tubule. (B) The Nortis physiologic system showing dual channel configuration and microfluidic features. OAT, Organic Anion Transporter. Several research teams have successfully developed 3D cell culture platforms. In 2013, Jang et al. 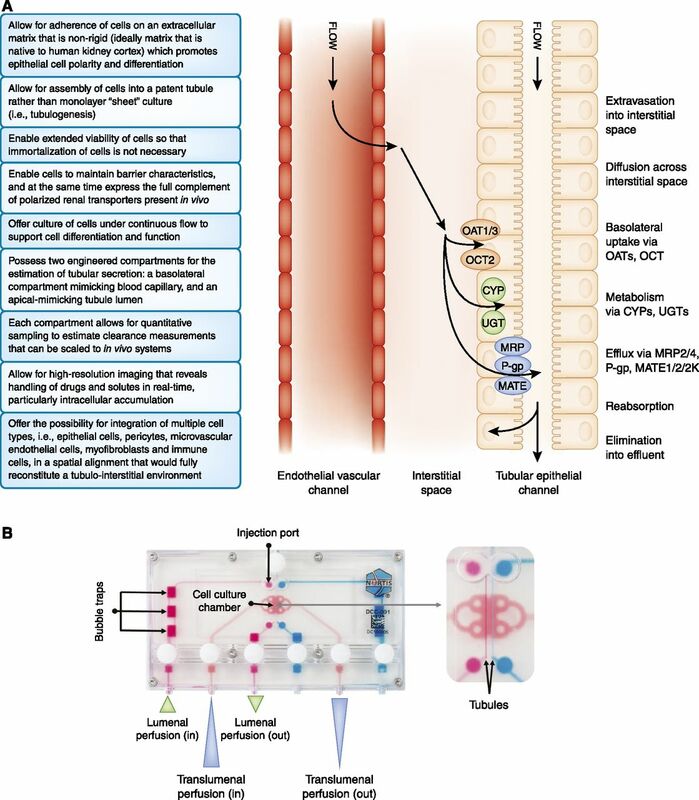 (3) reported development of a “kidney-on-a-chip” constructed with commercially available passaged hPTECs grown in a polydimethylsiloxane microfluidic device consisting of a lumenal flow channel and interstitial compartment; cells were grown on a static membrane separating compartments. Compared with nonfluidic, membrane-separated, dual chamber (Transwell) models, cells in the microfluidic model exhibit increased height, number of primary cilia, expression of sodium-potassium ATPase and aquaporin 1, albumin uptake, and glucose reabsorption, although to an extent lower than in vivo. An alternate model, reported in 2015 by Jansen et al. (4), established a bioengineered kidney tubule consisting of conditionally immortalized hPTECs grown on polyethersulfone hollow fiber membranes; the basolateral side of cells was attached to the outer layer of the hollow fiber membranes, with continuous perfusion through the fiber, allowing for basolateral delivery of drugs/compounds. Compared with cells seeded in Transwell, Organic Anion Transporter 1 mRNA levels were increased sixfold. Further utility of the model was shown by measuring the excretion of endogenous uremic solutes across the epithelium. As part of a publicly funded initiative to drive the development of innovative human cell–derived preclinical models that can accelerate the drug development process, Weber et al. (5) reported the development of proximal tubule MPS that exhibits long-term viability, retains polarized expression and function of proteins essential for reabsorptive and secretory transport, responds to physiologic stimuli, and performs critical biochemical synthetic activities. The MPS platform consists of a polydimethylsiloxane base with a collagen scaffold coated with extracellular matrix that supports the growth of approximately 5000 primary hPTECs in a tubular conformation (Figure 1B). Media are perfused lumenally or translumenally. In this microenvironment, cells maintain kidney epithelial differentiation and characteristic morphology for >28 days. The presence of constant flow promotes proper polarity of cellular proteins and maintains cellular differentiation, possibly due to primary cilium signaling. The apical brush border expresses functional sodium/glucose cotransporter 2 and γ-glutamyltransferase enzyme. Metabolic competence of the cultured hPTECs was confirmed by ammoniagenesis and regulated vitamin D biotransformation. The system showed transepithelial transport of organic anionic (para-aminohippurate and indoxyl sulfate) solutes that was sensitive to selective inhibitors and physiologically relevant secretion/expression of markers of kidney injury (Kidney Injury Molecule and Heme Oxygenase-1) in response to a variety of known nephrotoxins (aminoglycosides, analgesics, heavy metals, and chemotherapeutic agents), even when a toxic response was not observed in 2D cell cultures; this suggests that this system may provide a more accurate prediction of nephrotoxicity than conventional screening methods (6). This model also seems to perform receptor-mediated endocytosis, including uptake of protein-bound compounds via megalin. This model and other 3D models of the human proximal tubule in microfluidic devices constitute a promising in vitro approach. The concurrent development of microfluidic devices from many different organ systems (including components of the central nervous system, heart, liver, intestine, skin, bone, immune system, and reproductive organs) provides the potential to multiplex devices to observe multiorgan interactions. The connection of a hepatocyte chip to an hPTEC chip conclusively showed that human hepatocyte-specific metabolism of aristolochic acid I, an established nephrotoxin, substantially increases its cytotoxicity toward human kidney proximal tubular epithelial cells (7). A three-organ (gut-liver-kidney) system examined uptake, transport, and metabolism of terfenadine, trimethylamine, and vitamin D3 and showed potential for functionally coupled multiorgan human MPS for absorption, distribution, metabolism, and excretion studies; toxicology; and pharmacokinetics assessments (8). To date, most kidney MPSs under development consist predominantly of devices populated by a single cell type. More advanced models may recapitulate the requisite steps involved in proximal tubule secretion in vivo, specifically free passage of solutes across an engineered vascular endothelium into the interstitial matrix and the tubular epithelium posing as a tight cell barrier for transcellular diffusion of solute into the tubule lumen (9,10). A biomimetic MPS also holds great promise to model human kidney diseases and promote identification of safe and effective therapeutics; however, regulatory agencies (e.g., the US Food and Drug Administration) have not clearly defined the role of MPS in drug development. The authors gratefully acknowledge support from National Institute of General Medical Sciences (grant R01GM121354), and National Center for Advancing Translational Sciences (grants UG3TR002178, UG3TR002158), and an unrestricted gift from the Northwest Kidney Centers (to the Kidney Research Institute).